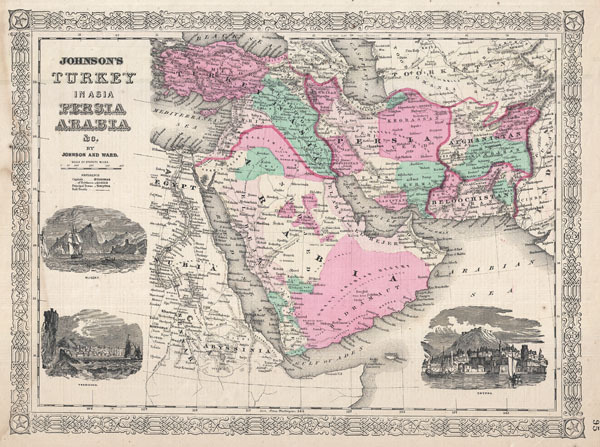 Johnson's Turkey in Asia Persia, Arabia & Co.
A very nice example of A. J. Johnson's 1866 map of Arabia, Persia and Turkey in Asia. Covers from the Mediterranean and Egypt eastwards as far as the Mouths of the Indus River, as well as southward as far as the Horn of Africa and northwards to the Black Sea. Depicts most of the politically volatile modern day middle east, including the nations of Afghanistan, Iraq, Iran, Saudi Arabia, Jordan, Israel, Syria, Lebanon and Turkey. Offers color coding according to country and region as well as notations regarding desert caravan routes, oases, roadways, river systems, forts and monasteries, and some topographical features. Ostensibly this map is very similar to Colton's 1858 map of the same region, however, there are a number of significant differences. Johnson reduced Colton's original map in order to expand the map westward by about 10 degrees, making it possible for him to incorporate all of Turkey as well as add significant detail in northwestern Africa and the Nile Valley. Johnson's retooling of the map also allowed for the addition of his three attractive woodcut views: Muscat (lower left), Trebisond (lower left) and the Castle and Port of Smyrna (lower right). Features the fretwork style border common to Johnson's atlas work from 1864 to 1869. Published by A. J. Johnson and Ward as plate number 95 in the 1865 edition of Johnson's New Illustrated Family Atlas. This is the last edition of the Family Atlas to bear the Johnson and Ward imprint. Johnson, A. J., Johnson's New Illustrated Family Atlas of The World with Physical Geography, and with Descriptions Geographical, Statistical, and Historic including The Latest Federal Census, A Geographical Index, and a Chronological History of the Civil War in America, 1866. Very good condition. Minor waterstain, most marginal, left center. Text on verso. Rumsey 2905.051 (1860 edition). Phillips (Atlases) 6140.051. Alai, C., General Maps of Persia 1477-1925, E387.